Spend and earn. That’s the name of the game when you’re leveraging the purchasing power of a credit card that earns rewards. If you’re going to spend the money anyway, or you have big-ticket items to buy, racking up reward points that you can cash in for some goodies creates a win-win situation for you. Check out these four credit cards that earn the best rewards (like cash, baby). The Blue Cash Preferred Card from American Express is a great option for everyday spending. If you’re the type that uses your credit card for EVERYTHING and then pays off the balance at the end of the month, then this rewards card is right up your alley. 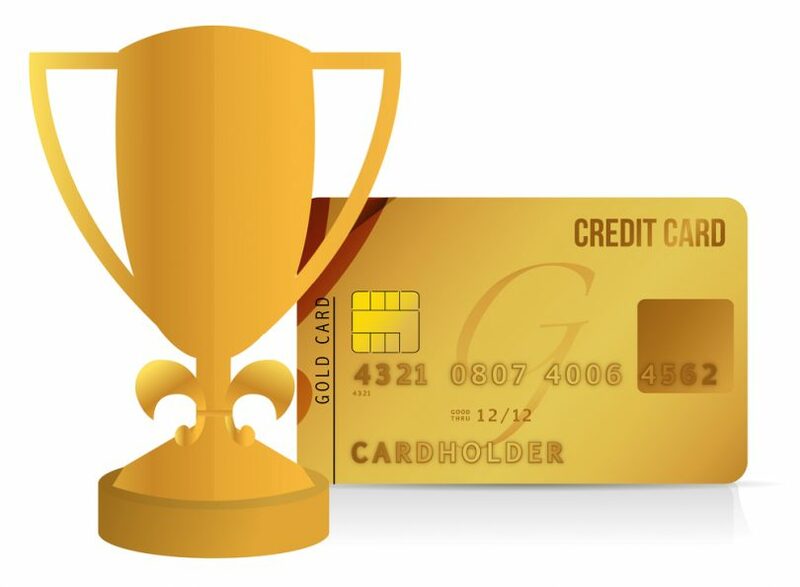 The biggest win with this card is that it offers the highest reward rate in the U.S.—offering 6% back on your purchases, maxing out at $6,000 per year. And, it doesn’t end there, folks. You can earn 3% back on gas purchases and department store purchases at an unlimited amount AND this is in addition to the 6%, $6,000 cap. And just when you think the deal couldn’t get any sweeter, AMEX ups the anty, giving you a $150 sign-on bonus if you spend $1,000 in the first three months you have the card. The good comes with a little bad news, however, because the card does have an annual fee that is a bit on the steep side at $75 per year. As long as you spend $1,600 per year (considering the 6% cashback reward) then it’s a wash—making the annual fee a moot point. Additionally, it is AMEX, which is not accepted everywhere. If you plan to use it abroad, the 2.7% foreign-transaction fee also receives a two-thumbs down rating. If flying the friendly skies is your thing, then the Chase Sapphire Preferred Card might be just what you’re looking for to earn airline miles. You can connect your Chase Sapphire Preferred Card to their Ultimate Rewards program. When you do, you can earn double points on air travel and dining—earning you up to 2.5% on the amount you spend in these areas. Depending on spending, the rewards rate ranges from 1.25% to the 2.5%. You also receive a sign-on bonus. If you spend $4,000 in the first three months you have the card, you earn 50,000 bonus points (which is worth $625 in Travel Rewards or $500 in cash). You can transfer the points you earn with this card in the Ultimate Reward program to airline and hotel partners at a 1:1 ratio to use in their reward programs for free travel and free stays. Here’s the real fun part: you can also use the points you earn for cash back or for a credit on your credit card statement balance. The only major drawback with this card is that the reward rate is lower when you compare it to other reward cards across similar spending categories. Another drawback is the annual fee is steep at $95, but they do waive the fee for the first year, so you can take the card on a test drive at no cost. It’s probably only worth paying the fee if you spend a lot on travel and dining. The card doesn’t come with some of the travel perks that other travel rewards cards come with, such as priority boarding and free checked bags that tend to come with credit cards co-branded with an airline. The Citi Double Cash Card is a new kid on the block when it comes to flat cash back reward cards. There’s no annual fee to grab this reward card. It’s a straight cash-back rewards card and as an added bonus, it offers one of the highest rates of cashback rewards because you get 1% cash back when you spend and 1% cash back when you pay it off. Cash back rewards come in the form of a credit on your credit card balance, gift cards or a check in the mail. The major advantage of the card is it’s easy to understand. You earn when you spend and you earn when you pay off, so just be sure to pay off your balance on time. A couple of drawbacks come with this card. For starters, there’s no sign-on bonus. If you’re expecting to use the card abroad, it carries a 3% foreign-transaction fee, which is high. The cash back percentage for this card is lower than other cards for specific spending categories. The Capital One Quicksilver card is one of the best when it comes to cash back rewards. One of the biggest advantages is it offers a flat-rate cash back percentage of 1.5% across all spending categories—making it easier to earn cash back and easier to understand what the cash back percentage is. With no annual fee, this card is starting to look better and better to those looking for a cash back reward card. If you spend $500 within the first three months you have the card, you earn $100 cash back as a sign-on bonus. The cash back percentage is lower than most reward cards. If you’re a traveler, for example, a travel reward card is probably better suited and more rewarding than this card. With a dizzying amount of rewards credit cards floating around in the financial universe, it can be difficult to figure out which one is the best one for you. It really comes down to deciding what is important to you and your spending habits. Once you evaluate these two items, it’s pretty easy to see which is the best reward card for you. What’s your favorite rewards card? Share your secret below! Creditkarma.com has some new offerings in addition to bank card credit scores from Trans Union and Experian. Now they are also offering free Auto Insurance scores and Tax preparation online. MIGHT BE WORTH CHECKING OUT! Who can deny any of these cards are excellent but there may be better cards on the market for consumers today. Consider Bank of America’s Cash Rewards card or Discover Card’s latest offerings BOTH ARE EXCELLENT. Both are well worth checking out and comparing to the cards listed in this article. You may be well surprised at what you will find. Wells Fargo is hands down the best credit card for rewards. You get a $200 sign up bonus and 2% cash back on everything you buy,I love this card!!! What is the best way or how is the best way to check your credit with out paying for it? Join creditkarma.com, creditsoup.com or nerdwallet.com. All three offer free credit scores. As far as a free credit REPORT, you are entitled to one free report per year from each of the major reporting bureaus (Equifax, Experian and TransUnion), which may be requested through annualcreditreport.com. It’s Credit Karma! Used for years.